In introspection the mind itself is the subject of study. Perceive through the senses, but do not allow the mind to get fascinated by mere perception. Worry is a wasteful extravagant habit of the mind. It costs much and still it produces no results. Detachment is that smartness of the mind which enables us to get detached from the false, painful things. Even though you have not conquered the battles of the world, you become the world-conqueror when you conquer your mind. A quiet mind produces a more brilliant intellect. Any attempt of mind to rise from the low values of its present existence to a healthier and diviner scheme of living is Yoga. To forget oneself totally, one's mind should keep awake at every moment. Steady mind moulded through devoted sadhana is a power of peace. The suffering of each depends, not upon the factual happenings, but upon the texture of each one's mind. What we regularly encourage and constantly cultivate in our mind determines our character formation and ultimately our destiny. Take what life has to give you as the Lord’s gift prasada. Sorrows polish off the vasanas and tears are the "Brasso" of the mind. Mastery over the mind ends in a great and intense integration of one’s personality. At the place of worship, see His form with your eyes, see Him Himself with the mind turned within. Attempt to get a glimpse of the infinitely joyful Self by calming the mind and not by fulfilling desires. When you have Him in your mind, whatever you do in the world is known as padasevanam. This is also practice of devotion. In spare time train your mind in the art of watching mind gurgling all kinds of emotions & thunderously flushing down the avenues of time. When all the sense organs are persuaded away from their individual fields of activities, the mind comes to rest peacefully. To ‘listen’ is not merely to ‘hear’. We in life ‘hear’, but very rarely do we know how to ‘listen’. Happiness and peace are his, who has trained his mind to react positively to the world outside. Freedom from the mind is true freedom; one does not need to live in seclusion to achieve this. A mind held at concentration brings into view the deeper thoughts which were till then hidden from it, due to its own fluctuations. Let us try, achieve, and be inspired by our mind’s ability to remain undaunted in an exalted attitude of divine purity and peace. Appreciating the mind as `ALL SILENCE'. `I AM' in meditation. The real Guru is the pure intellect within; and the purified, deeply aspiring mind is the disciple. "The guru is nothing but pure consciousness, Bliss and eternal wisdom". A weakling cannot ever reach spiritual brilliance and total freedom. Courage comes from faith in the Guru and in the path. The very nature of a Guru is both inclusive and unconditional, and that expansive quality draws people from all walks of life. The Guru's form and the worship of His form is to reminder to us of our Formless nature. Contemplation is not an intellectual comprehension or an emotional appreciation. It rests on the two, like the two wings of a bird. Regularity is the beginning. Sincerity is the next step. Learning the art of mentally and intellectually living the philosophy is the goal. Make your intellect a storehouse of right values. Scriptures are not mere books for intellectual studies. We must learn to assimilate these ideas and come to live them. The purpose of religious practices is to help man tune his inner equipments with this intelligent dynamic Conscious Principle. Truthfulness is the spirit to live honestly our intellectual convictions within. Ego and Ego-centric desires together constitute "attachment"
Often detach yourself from the role you play, and look at the world with no reference to your body-mind-intellect. Detachment from things and emotions, thoughts and happenings can come only as a result of constant practice. There is no harm in enjoying. Just don't get attached to your enjoyment. To the accomplished, there is nothing to detach from. For, when the falsity is realized, can there be ownership? Attachment is a mental knot with which you have tied yourself to things and beings all around. It is self-made slavery. Detached from the false, attach yourself to the Truth! Working with attachment leads to perspiration, not inspiration. Work should not exhaust oneself; it should only exhaust one’s vasanas. The secret of inspiration, and a work done under inspiration is certainly a thousand times more irresistible in its effectiveness. "Masters cannot be comprehended by the intellect. They are deeper than that"
Meditation becomes a true education, a secret preparation of ourselves to face the world of changing circumstances. Aloneness is not in the surroundings, but it is in one’s attitude of remaining with all attention fixed upon that one Goal. Aloneness is different from loneliness. In meditation, minimize thoughts and reach to one; stay there until it disappears in No Time! Expand inwardly. Grow to your full stature. You can achieve growth and expansion only in and through meditation. The greater the amount of concentration that a seeker can apply in his everyday life, the greater will be his success in meditation. Regular meditation let us move towards the realm of such a true rediscovery. Humor lightens the heart, invigorates the spirit, opens the mind, and invites others to be near you! Laugh! We choose our Joys and Sorrows... Long before we experience them. Learn to be happy alone. If we do not enjoy our own company, why inflict it on others! Don’t be jaded, observe and enjoy God’s creation. Positive thinking is much easier because it brings in its wake harmony, peace, joy and inner realisation. Dreams can give only a vague sense of joy, but cannot offer any actual dividend of happiness to the dreamer. Work enthusiastically without worry of result. Courage of conviction and tireless enthusiasm to continue, we must have in plenty. Success is sure for the sincere seeker. The workers and the missionaries must discover in themselves the secret of invoking this trajectory force of true and flawless enthusiasm. Small efforts continuously & cheerfully put forth, pyramid up to become the edifice that stands out as great work & noble achievements. 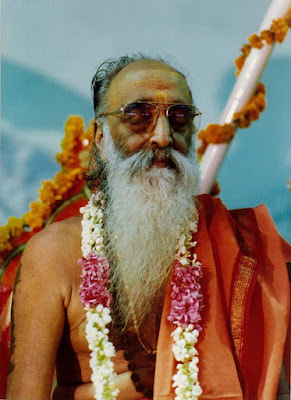 We are in His lap,where He is polishing us.A true devotee will never feel that he is suffering,though others may think that he is suffering. As long as God is, His devotee cannot suffer starvation or sorrow, or come to ruin. Where individuality is merged in His sacred temple of Love, universality starts, the experience of the infinite in us unfolds. Live plunged in Thoughts Divine. Now and then come up to play the life outside. Everything else will be added unto you. The Ultimate or the Absolute has to be One; it is the same that is within each of us, trying to rediscover Itself! Learn from the form you worship. Be strong in your faith in the One. Faith is, ‘To believe what you do not see’, the reward of which is, ‘you see what you believed’. Be a witness. Smile away. Hold on to faith in yourself and in the final justice and victory of His span of growth. All spectacular successes were achieved in little courageous steps taken with self-confidence & faith in the nobility of final goal chosen. It is prayer that brings the reviving rains of joy and transforms the dreary wasteland of our hearts into a perfumed garden of bliss. If we can turn our attention for a few moments a day to call out to Him, it will be the most effective prayer. Prayer is power. Invoke it and bless yourself and others around you in your community. "Service in this world is the highest prayer loving people around us is the greatest devotion". Prayer time’ is constituted of moments when man tries to realise that he is made of the nature of God, the being of infinite Life. In our sincere prayer to serve mankind, we must first become aware of the magnificent faculty within us. Every deed, word, and thought of a realized Saint is a masterpiece; for all those are his offerings to the Almighty! Do the best; leave the rest on to God. Every act of sharing is a sacrifice. When it is done for the betterment of humanity, its status becomes equivalent to worship of God! Your strength becomes the strength of ten because you believe! Believe and achieve! Such is the law of success! Incompetency in life generally springs from our false and hasty conclusions that we are impotent, insignificant and ineffective. Let us not worry for the recognition or for the reward. But let us be more anxious for the quality of our work. Once we have caught the melody of life & unerring rhythm, the personality in us becomes fully tuned up & ready to initiate great activities. Study, Pray, Meditate, but love, love, love - that is what life is all about. Clarity in vision, chastity in expression and purity of action are sure signs of spiritual progress. Daily prayer and meditation are all wonderful therapeutic agencies in building up peace and happiness within an individual. Remember, one of our noblest duties in life is to grow. This is the screaming cry of all evolution. We Must listen to learn. We Must serve with ‘love’ to grow. We Must meditate to realise. Practice nonviolence, and get rid of jealousy, hatred, and selfishness. But the real sadhana is to reach the final goal — liberation. Make your life a celebration of His presence. We must go to the great spiritual sources in us for our real happiness and for a life of entire satisfaction. The teacher is sacred not because he is God but through him, we gain a peep into the beauty of the infinite Lord. To live large life, everyone of us must have a rich store of personal courage. Let us recognise and feel the inexhaustible ‘Power’ in the Self. Let us grow through prayer. We can develop through study. We should open up through meditation. Through prayer and meditation, let us come to feel our oneness with the infinite Lord. Not sickness, but health, is the greatest of medical mysteries. The greater the understanding of the world of objects, the better shall be our relationship with it. When the intention is noble, the act is also noble, whatever be the act. Never complain, about the number of hours you have put in, to do a job. You can stop worrying by refusing to worry. Surrender all your worries at his feet. Man can change his destiny-not by wishing for it, but by working for it. Let every moment assert and affirm the goodness within us. We should all cultivate an extremely hopeful, thriving selfless affection towards the world around us. In the material world, extroversion is a necessary attribute for knowledge, while for wisdom, introversion is a mandatory prerequisite! The actual delay in Self-realisation is only in gaining by ourselves for ourselves the required inner purification. Creation of a lofty vision and living to fulfil a greater mission adds a meaning & a significance to our life. The more often thoughts are consistently maintained on a high standard, the nobler our life and actions will be. Learn to discipline ourselves to become such effectual servants of the community. If our mental attitude is optimistic, cheerful, heroic, it will flash forth in the very way we stand, sit or walk. The power of right thinking expels all false thoughts and induces healthy conception. Wisdom is not about how much you know, but how deeply you know yourself. The darkness of hatred will only be dispelled by kindling the light of humility and love. Nothing can remain the same even for a short period in the world of objects. Continuous change alone is the changeless law. Every experience in life can make you either bitter or better. You have to make the choice. Man's control of nature external is called civilisation. His control of nature internal is called culture. Spiritual living is the Science that teaches us how to repair our broken hearts and draw the music out of them. Determination should not turn into arrogance and resolution into obstinacy. Often they do... Love is the antidote. "What is beautiful is not always good, but what is good is always beautiful". Everyone wants to become somebody in life, but a true seeker seeks to become nobody. As he advances toward his goal, the Lord takes over. Practice moderation in thought and action. Perform every act as an offering to the Lord, remembering Him. Be steadfast in your goal. Work with an attitude of surrender. Kill the ‘little I’ and live. See, think and act as the ‘great I’. To react and retaliate is weakness; to endure is strength. Patience fosters and fortifies peace! "Humility is the virtue of the culture". Surrender to HIM inspite of Freedom' is the way of wisemen. Nobody can take from you what you never took for yourself. A true saint is like the sun; the world will know him even if he remains in solitude. All attempts of leading a spiritual life are to bring about consciously a change for the better. And we have got this capacity to change. Mental discipline is the secret of all efficiency, the conduit of poised competency. "Whenever you need me, close your eyes, look into your heart and I will be there!" When our vision is true and our goal divine, we need not hesitate at all in tumulting ourselves into action. There is no greater time to act rightly than the present. Person is successful who makes a practical use of at least one talent that he possesses. We must learn to discipline ourselves to become effective servants of the community. The secret of success in life lies in ‘keeping the head above the storms of the heart’. Be active and tirelessly dynamic. Face life and its upheavals around you. Behind every achievement that we see in this world today, is the unseen hand of human will. Looking at our past, we are now helpless victims of our past actions but looking ahead of us, we become the architects of our own future. If we are available, the greatest achievements are possible. There is no shortcut, no quick path, no mysterious and secret way. Our success depends upon the amount of transformation we can successfully bring about in our personality and character. The training given to the citizens of Bharata to live this (Upanishads) Sanatana-dharma is called Hinduism.